Poor Dude. But he's all better now. There are times when I think I'm crazy. For instance, last Friday David went on an overnight camp-out with the Young Men and I decided this was the perfect time to take all four children by myself to Carl's Jr for dinner and to play on their play place. Things went well until just before I was about to leave. Griffin came running to me, screaming and holding his arm. I didn't see what happened, he was running over to the play scape to watch his brothers, but he can't get up on anything by himself, so I assume he fell somehow. Well, I didn't think much of it, just held him while he cried. I was thinking he was just over tired. I gathered up the kids and tried to hand Griffin a drink, but he couldn't grab it and he wasn't moving his arm. He was still obviously upset and in a bit of pain. That is the worst feeling in the world. I didn't think his arm was broken, but something was not right, so I drove straight to the emergency room. With all four kids. By myself. This is when I realized that I'd left my cell phone at home. I knew my mom was working a booth at the Orem Summerfest, my dad had had surgery on a hernia that day, Melissa was home, but her husband works nights and she couldn't leave her kids, so that left me to deal with everything. Once I realized that, we did OK. We were in the emergency room for almost two hours. Luckily, Aubriana didn't need to eat and a very sweet, college-aged girl offered to watch Maxton and Xander while I was in there. Truly an angel. They had so much fun with her, drawing Father's Day cards. I felt just horrible. Griffin was so tired and in a lot of pain. They gave him some medication for it, and he fell asleep in my arms. I was having a hard time not crying myself. It was so hard to see him like that. He was so cute, he kept asking for Daddy, for Max and Xander and for Aubrey. He also liked it if I jiggled his foot. We played This Little Piggy to distract him, a much quieter version that we usually do. 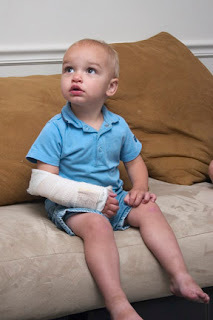 They took X-rays of Griffin's arm and when the doctor came back, he said that the radiologist "thought" he could see a "buckle" in the bone of Griffin's wrist. So, it wasn't broken or fractured, but they didn't know exactly what had happened. They put a splint on his arm and we went home. 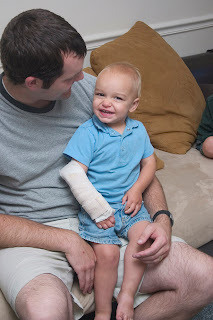 They said if he started to use his arm in the next few days that he could take the splint off. He didn't use it for a while, but then he started to a little bit on Saturday afternoon. He still couldn't pick anything up with it, but he was at least moving the arm. He was amazingly good about keeping the splint on, until the last day. Actually, I thought we could have taken it off a bit earlier, but I wanted pictures. Hey - did you know you were featured over here! I somehow missed this project of yours, but it's gorgeous!